Pyogenic granuloma is a benign skin condition caused by the rapid proliferation of blood vessels. Lobular Capillary Hemangioma is the correct name. 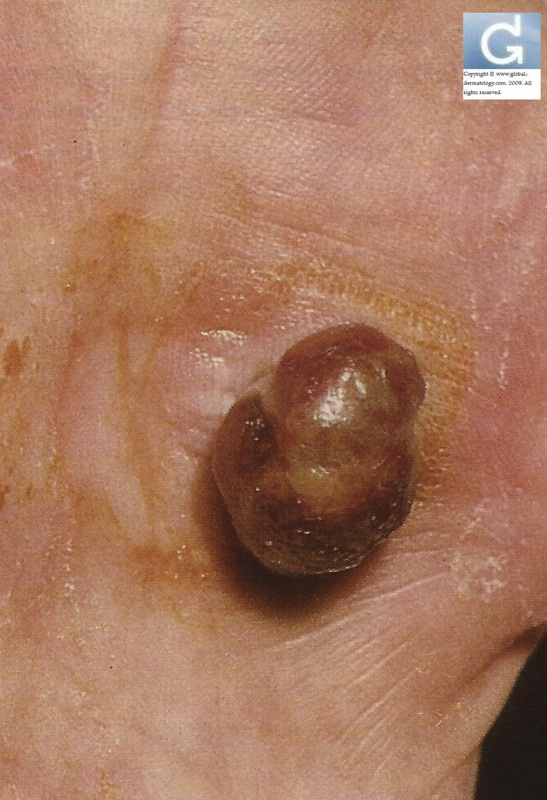 Clinically, pyogenic granuloma presents as a fast-growing nodule (s) which is easily broken. Its color (colour) ranges from red to dark brown. It can be localized (localised) anywhere but is often present on the hands, the arms and the face. During pregnancy, it is often localized in the mouth (oral cavity). On microscopical examination (histology), numerous capilalries (small blood vessels) “back-to- back” are present. The are often arranged in a lobular pattern. Thus the correct designation for the condition: lobular capillary hemangioma. Pyogenic granuloma is formed by the proliferation of blood vessels. (This implicates the production of angiogenic factors, of nitric oxyde synthases (eNOS). Proliferation markers have also been found on the blood vessel walls (CD34…)). Trauma is often the primary factor leadin to the development of pyogenic granuloma. However it can also appear spontaneously. Pyogenic Granuloma is a misnomer, because on histology, there is neither a granuloma nor the presence of pus. If it is benign, why bother ? It is important to show the lesion to a medical doctor who will refer you to a dermatologist if there are any doubts. Indeed, this condition can look like others which aren’t always benign. Small lesions can disappear spontaneously. Treatment options include cryotherapy and electrocauthery.